Ladies and Gentlemen, the Ferreteer repurposes my self portrait based on a suggestion from Tom Bickle. Ferreteer has made me laugh out loud before with his PhotoShop shenanigans. It’s a lovely morning. Feeling great. my back was hurting yesterday, but it’s much improved today. Today’s a pool day, I believe. Joe Crawford blogged this at 9:35am in 2005 in August. The 28th was a Sunday. You are reading this 14 years later. Comment. There is one comment Tweet. Send email. It has hashtags→ drawings . Awesome! I am hugely gratified that the Ferreter ran with it. 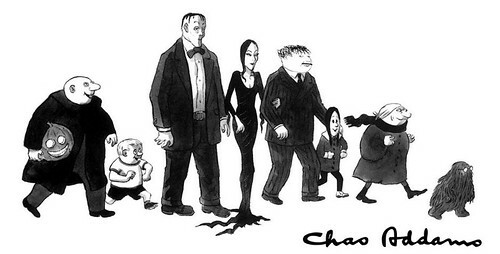 I had a helluva time finding that Addams family image I noted, but it was worth it to see this.